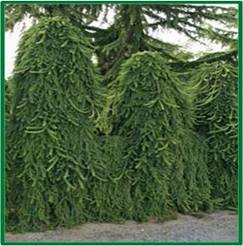 Weeping Norway Spruce is an unusual, irregular shaped evergreen. Its form depends on how it is trained when it is young. If it is not staked and supported, it generally will not grow upright, but will spread low or on the ground as a woody evergreen ground cover. When staked and supported, it can grow upright to a height of 15’ – 20’. Weeping Norway Spruce can be low maintenance with no problems. 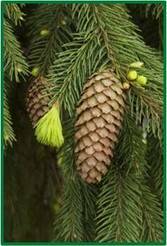 It is deer resistant and can grow in any well- drained soil type with consistent moisture. It does require at least 6 hours of direct sun each day. 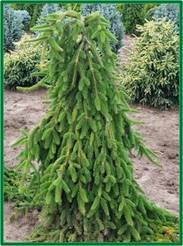 If you are looking for a weeping look that accents any landscape, especially a water feature, Stratham Circle Nursery would recommend the Weeping Norway Spruce.